It’s cold out there.. but Nature’s spring tonic is bursting into growth! This is what I found when I went for a (rather muddy!) stroll along a short stretch of London’s New River yesterday, from Castle Climbing Centre near Manor House tube station to Seven Sisters Road. As you’ll see from this set of photographs I took, many of the plants were rather hard to identify in their dead, wintery states, but some of the new growth coming through was unmistakable. 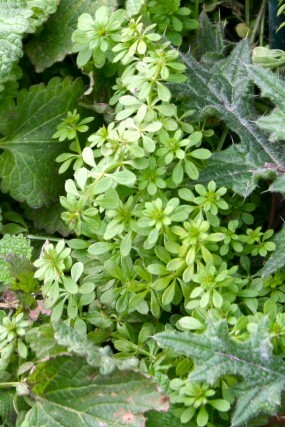 The feisty cleavers (Galium aparine), pictured here, is one of the earliest greens to appear after winter, and tends to grow most comfortably with its favourite companion, nettle (Urtica dioica). Traditionally, these were picked along with other nutritious spring greens, such as dandelion leaf and chickweed (these two I also found on my walk) and eaten fresh, as tea or in the case of nettle, in soups etc., as a way to replenish vitamins and minerals after a winter of grains and cured meat and little else. Chickweed, for example, is rich in Vitamin A and C, as well as copper, iron, magnesium and calcium. Dandelion greens are rich in potassium and vitamins A, B, C & D, and nettle leaves, amongst other things, are particularly rich in vitamin C and iron (Bruton-Seal J. & M., 2008). NB always use thick gloves if you’re going to handle nettles! I will try to gather together some delicious recipes for the above spring tonic herbs! Other herbs I spotted were Ribwort (Plantago lanceolata), White Dead Nettle (Lamium alba) and what looked like Sweet Violet (Viola odorata). Ground Ivy (Glechoma hederacea) and Jack by the Hedge (Alliaria petiolata) are a little hard to tell apart at this stage of growth, but I’m certain they were both there. This is just the beginning. Springtime – here we come!